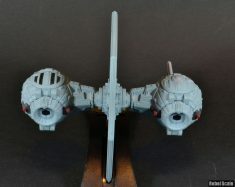 This was a very fun model that I designed after the TIE Experimental fighters of the X-wing Alliance PC game. 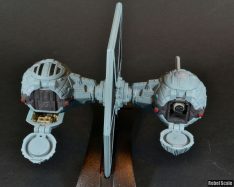 It is a combination of two AF TIE Fighters and random plastic parts for details. The turbolaser is from a leftover missile launcher from the AF Republic Gunship. Attaching the wing to the pods required a lot of putty. Also, the outer edge of each pod required a good bit of putty. 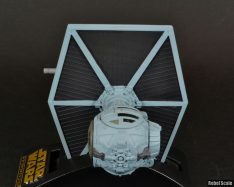 I painted this TIE in a custom grey/blue/white mix that is very similar to the colors of the AF Vader’s TIE and TIE Fighter. I then hand painted most of the dark grey and red details. 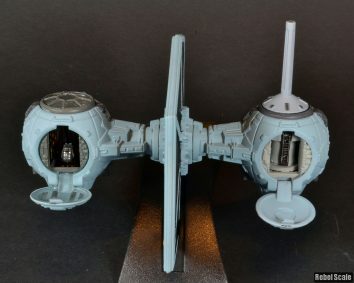 As seen in the X-wing Alliance PC game, the TIE Experimental M1 or TIE Bizarro (as Rebel pilots called it), was a small starfighter designed to carry a single turbolaser. This craft was a droid ship, slaved remotely to a control ship. 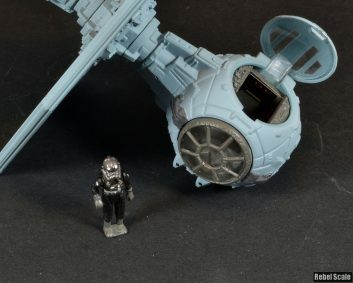 However, this variant features a human pilot instead of a droid receiver brain. 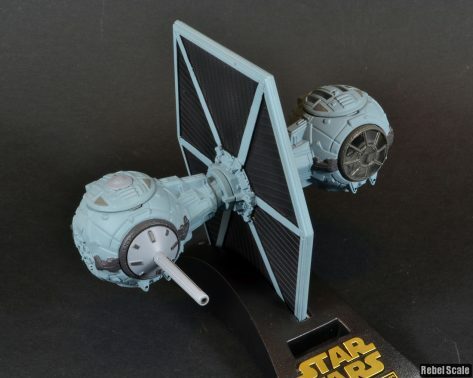 While short-lived, the TIE Experimental M1 saw use as a heavy-hitting assault fighter, capable of attacking starfighters and capital ships alike. 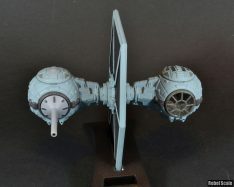 However, without shields, it was easily picked off by Rebel ships. After the destruction of the Sardis (an Imperial Research Ship), and the Obsidian (the manufacturing platform), the TIE Experimental project ended, and was the first of many failures by the now-deceased Admiral Zaarin in his bid for Imperial power.